Poop: The Game is a simple to learn card game that has some similarities to other popular card titles like UNO. And believe it or not, it’s fun for both adults and kids to play! How?!? Read on to find out! In Poop, the goal is to get rid of your hand. Each player (up to four) is dealt five cards, and there is a special set of cards that has a picture of a toilet on it and a number. Players take turns placing one card on the table. Most of the cards have numbers on them, representing poop. If you place a card on the table and the total number of cards exceeds the number on the toilet, you ‘clog’ the toilet and must take all the cards in the pile. Since you’re trying to get rid of all the cards in your hand, this is a bad thing to do. There are many ways you can prevent this. If you can match three cards of the same color when it’s your turn to put a card on the table, you ‘flush’ the toilet and all the cards in a pile go to a discard pile and every other player must draw a card. There are also special wild cards that allow you to skip a turn, reverse an action, and more. Sometimes you must make a sound (like farting or flushing) to go along with your card, and if you forget, the other players can call you out and you won’t be able to perform that action! So the best strategies are to try and not make your cards match, and to plan ahead and see if the toilet might clog on your next turn! The game comes with extra cards that have rules printed on them. It was a little hard to read the rules at first, because the print is so small. And it takes a few turns to really understand how to play. Even though the game is like UNO, you can’t have an UNO mindset when playing. The cool thing is that the game also comes with other rule variations and ideas, such as a game similar to Slapjack (called Crapjack here), and variations where you can’t see your deck and others. There is even a drinking game, too! Sure the game can be a little immature and disgusting, but let’s face it, we’ve all laughed at poop and fart jokes before. So if you can get past that, you can still enjoy this game. Below is a picture of some of the cards. Yes, that is corn in one of the poop cards. Yuck! The green box pictured below is an expansion pack that has more cards so up to 8 can play, and it has some new wild cards, too! OK, I know parents don’t want their kids laughing at poop jokes, but come on, you know they’re going to do it anyway. The game is perfectly safe for kids if you don’t mind that, and it’s easy to learn, too. If you do have kids, I’d recommend taking the drinking game card rules out of the deck, though. And certainly let your kids know when poop jokes are inappropriate, like in church and in restaurants and such. 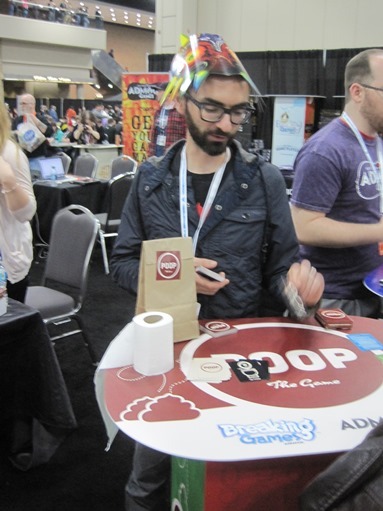 When I went to PAX South a few weeks ago, I met with Blaise Sewell, the creator of Poop (pictured below). He showed me a demo of the game and even gave me a review copy of it, which is how you’re reading this review right now! He said he created Poop: The Game with his son, so I thought it would be neat to interview him about that. Make sure to read on and find out how you can buy a copy of Poop: The Game. Cary Woodham: At PAX South, you said that you co-created Poop: The Game with your seven-year-old son. Tell us about the process of how that went. Blaise Sewell: Emery, my son who was six at the time, was very interested in the games I was creating but they were all too complicated for him. We built a few games together, including a Paper Mario card game called Paper Paper Mario, but POOP became the winner. I knew we’d created something fun together when the whole family was playing and laughing together. Did creating a card game bring you and your son closer together? My son and I have always been close and now we have this amazing game that we collaborated on together. You could say our friendship became stronger because we have yet another layer to our relationship. What were your son’s contributions to the game? Emery brought the POOP and UNO themes to the table, he loves both of those things, and I tasked myself with melding them together and figuring out the game mechanics. We had the “Don’t Clog the Toilet” mechanic down early and then we figured out the Flushing and Wild Cards as we played the game. What advice would you give others who wish to make their own board or card game? Oh man, I could go on forever with advice on making games. I wrote up an essay called All the World’s a Game and We’re Mere Players and it’s an excellent start on where to find the spark of inspiration. The key points have to do with playfulness and inventiveness. Look at the world around you and find the games that are already playing out in front of you. They already exist! Just look at pooping, it’s a game – in real life the Game Over moment or worst case scenario is The Clog. The way to avoid The Clog is by flushing. While this is a very simple example of the philosophy it shows how easily it can be applied to everyday situations. Please tell our readers how they can get a copy of Poop: the Game. POOP: The Game is currently available for Pre-Order at www.FeelsRightDesign.com – We sold out at PAX South and will have more in March. It will also be available in TBD retail stores, Amazon, and www.BreakingGames.com.